If you follow me on Pinterest you know that I have a board called Yummy (and you can tell when I’m hungry because there will be like 5 recipe pins in a row). One day I said to myself, “Self, why don’t we actually make some of those recipes instead of just drooling over the pictures?” And so I decided to put on my apron (figuratively) and get cookin’. 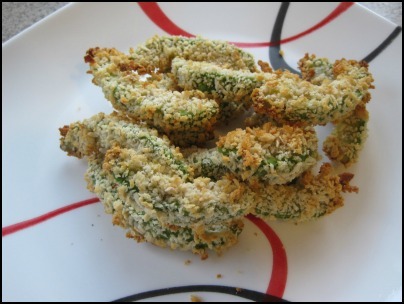 The first recipe I tried was Baked Avocado Fries. Let me start by saying I love avocado! If you’ve been a follower since February you’ve already heard me declare my love for avocadoes. So of course I had to try avocado fries! Review: Meh…they weren’t nearly as good as I was expecting. When I looked back at the original recipe I noticed that she sliced the avocado into larger chunks than I did. That probably would have made a big difference. Mine were too much breadcrumbs, not enough good stuff. They also could have used more seasoning. I thought they were a little blah. I only needed to buy an avocado to make these (hooray for cheap side dishes) and the recipe was easy to follow. However, 20 minutes was way too long to cook them. Maybe it’s because I only used 1 avocado, but mine were ready in less than 12 minutes. I’m going to try these again, but next time I’m going to slice them thicker and season them differently. I’ll let you know how they turn out. The next recipe I tried was Chocolate Chip Cookie Dough Cheesecake. Doesn’t that just sound amazing?! How can you go wrong with cookie dough and cheesecake? You can’t IMO. This recipe is definitely going in the “keeper” pile! I have a lot more pinned recipes that I’d like to try. If y’all are cool with this post I’ll definitely share how they turn out. Have you tried any of the recipes you found on Pinterest? 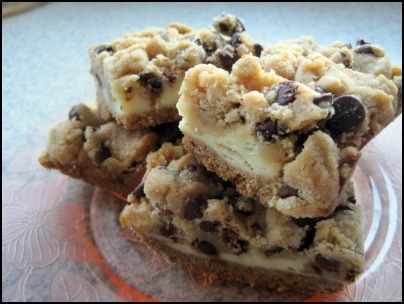 I MUST have a bit (or five) of the Chocolate Chip Cookie Dough Cheesecake!